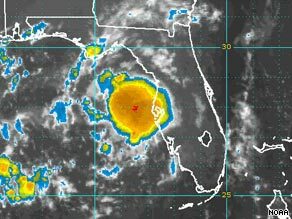 A warning was issued overnight for a potential tropical storm that may hit the Florida-Alabama border Sunday. It formed in the eastern Gulf of Mexico, according to the National Hurricane Center. A tropical storm warning means that weather conditions will deteriorate in the next 24 hours. The system, still a tropical depression, was about 125 miles south-southeast of Apalachicola, Florida, at 8 a.m. ET, according to the center. It was expected to reach tropical storm strength by Sunday afternoon. The depression was moving toward Florida at about 16 mph, forecasters said, and the center of the storm should be very near the northern Gulf Coast of Florida by late Sunday afternoon. Maximum sustained winds were near 35 mph with higher gusts. The storm could bring 3 to 5 inches of rain, with isolated amounts up to 10 inches, and storm surges across portions of North Florida. Meanwhile, two other storms continued to make trouble for the Caribbean on Sunday. Tropical Storm Ana was threatening the region as it continued moving west, according to the National Hurricane Center. Also, Tropical Storm Bill — expected to become a hurricane Wednesday — should be watched closely as it heads east in the Atlantic, possibly toward Florida, said CNN meteorologist Reynolds Wolf. The storm was 1,640 miles east of the Lesser Antilles on Sunday morning. Bill may reach Category 3 status as it bears down on the Leeward Islands Wednesday or Thursday. Ana formed overnight on Friday. The Dutch Antilles issued a storm watch for Ana in St. Maarten, Saba and St. Eustatius, meaning tropical storm conditions are expected to hit the islands within the next two days, the National Hurricane Center said. The hurricane center is advising the Virgin Islands and Puerto Rico to monitor the storm’s progress, but it has weakened in the past 24 hours, CNN’s Wolf said. As of 8 a.m. ET, Ana’s maximum sustained winds were 40 mph and it was moving west at about 20 mph, the center reported. Ana may eventually hit Haiti and the Dominican Republic, but forecasters can’t say whether Ana will strike the continental U.S.